This year marks the 100th anniversary for some women in Britain being allowed the right to vote. It was the start of a move towards general suffrage for women. In marking this event, Nuneaton Museum & Art Gallery was invited by prestigious arts organisation Artichoke to take part in their fantastic PROCESSIONS project. This will see 100 organisations from across the country parading 100 banners which celebrate the achievements of the Suffragettes. 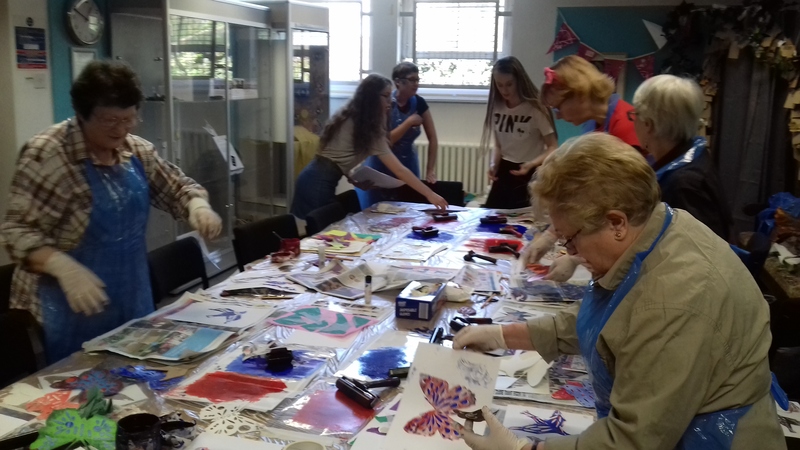 As part of this project the Museum has been hosting a series of printing and textile workshops involving women from across the borough, to design and produce their own Suffragette banner. Textile and print artist Tracey Watson has been leading the workshops, demonstrating amazing print techniques to create our unique banner. As a finale, participants will be travelling with members of the Museum team to London on 10 June to parade the banner with other groups from across the country. Simelar events will also be taking place in Belfast, Cardiff and Edinburgh on the same day. We’re very pleased and proud to be taking part in such an important national event as well as representing the borough in the capital city. For more information on the project visit http://www.processions.co.uk and watch out for further updates! 1 Response to Deeds Not Words! Also read this morning about the possessions on 10th June.